Yesterday was book club day and that meant an occasion to bake something new. The book of the month was “The Book Thief” by Markus Zusak; which is set in Germany during World War II. 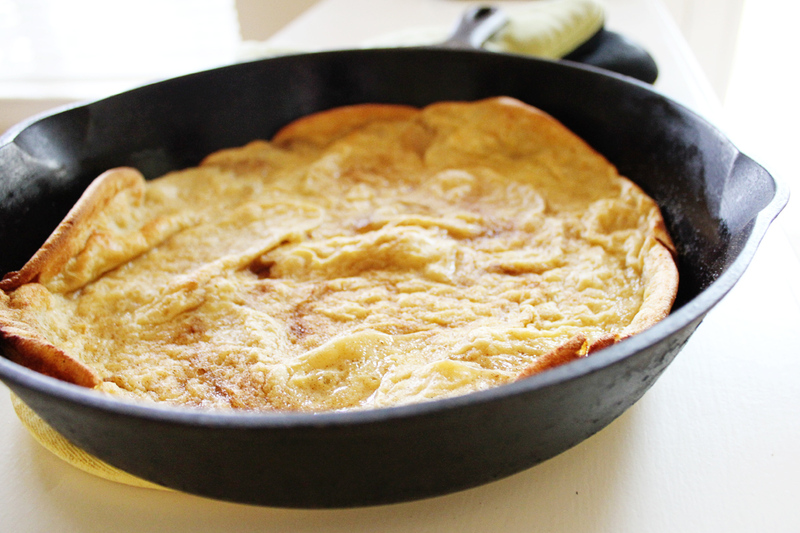 So I decided it would be fun to make a German pancake, aka a Dutch Baby. I wanted to include apples and cinnamon to really amp up the flavor and I was intrigued to see the results of using coconut oil instead of butter. All I can say is wow, it really does taste as good as it smells! Best served warm, I almost pulled the car over and tried a bite before making to my friends home. A great breakfast treat or dessert, I can’t wait for you to try this recipe; enjoy and happy baking! Peel and thinly slice your apple, melt 1 Tbs of coconut oil over low heat and saute the apples with 2 tsp of cinnamon and the honey until soft. Preheat your oven to 425 degrees. Prepare a 10″ cast-iron skillet with the remaining 2 Tbs of coconut oil and arrange the apples over the bottom of the pan. Whisk together the eggs, milk, flour, salt, vanilla, lemon juice and brown sugar. Pour the batter over the apples and bake for 20 minutes, until puffed and golden. Carefully remove from the oven and sprinkle with cinnamon sugar, slice and serve warm. I love that book! I accidently spent hours in the bath once when I got into it! I love how it’s written! This is a fantastic recipe too, thanks! Thanks Emma! It really was delicious, I can’t wait to make it completely vegan for my sister when she visits! I have highlighted you in a blog love post on my blog today! This looks delicious! Mind making me one? 😉 I will have to keep this for a future baking date in my kitchen!